WinSockFix is a free Windows software, being part of the category Software utilities with subcategory Operating Systems and has been created by Option Explicit. It's available for users with the operating system Windows 95 and former versions, and you can download it in English. The program version is 1.2 and the latest update was on 2/28/2006. Since we added this software to our catalog in 2006, it has obtained 310.047 downloads, and last week it had 209 downloads. About the download, WinSockFix is a light program that will require less free space than the average program in the category Software utilities. It's a very popular program in countries such as China, Russian Federation, and India. WinSockFix offers a last resort if your Internet connectivity has been corrupted due to invalid or removed registry entries. It can often cure the problem of lost connections after the removal of Adware components or improper uninstall of firewall applications or other tools that modify the XP network and Winsock settings. 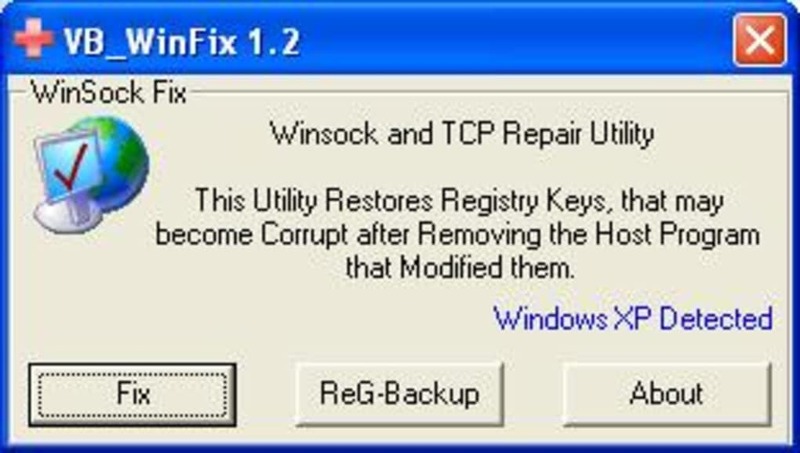 If you encounter connection problems after removing network related software, Adware or after registry clean-up; and all other ways fail, then give WinSock Fix a try. It can create a registry backup of your current settings, so it is fairly safe to use. We actually tested it on a test machine that was having a Winsock problem due to some Adware removal, and after running the utility and rebooting, the connectivity was restored. Terrific. Used it literally dozens of times in the past several years. Also helps undo all the internet 'tweaks' that may have bolluxed up your throughput and LAN connections. It returns you to an almost 'fresh install' type state for your TCP/IP networking. Previous guy talking smack ... its excellent. This worked first time as saved me huge amounts of hassle!! Well done chaps ... My sister's pc had a trojan virus took me a combo of spybot and cccleaner to zap it but though my pc seemed to be unable to get online though the ping test was working fine. I tried help lines and waste hours but this simple download &lt;from another pc ofc&gt; worked in 20 secs. Easy to use and worked at once. ...Internet Explorer cannot display the webpage....WinSockFix. This file was joke as it did nothing but give me the BLUE SCREEN OF DEATH and did not fix anything. What do you think about WinSockFix? Do you recommend it? Why?